Bushfires are all too common in Australian with more and more land being zoned as bushfire prone. If you’re building in a bushfire prone area there are additional requirements for building materials that need to be considered. 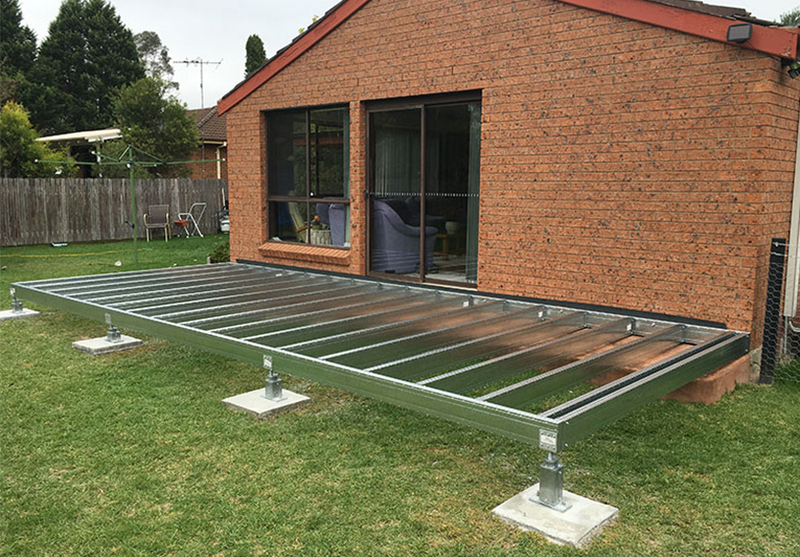 Spantec piers, decks, suspended floors and roofs can be incorporated in designs to meet the requirements for all six Bushfire Attack Levels (BAL). The details below provide an easy guide for using Spantec products in residential buildings in bushfire zones. Designers should note that the two standards above describe distinct, standalone construction solutions. Apart from specific cross-references where appropriate, the two standards cannot be “cherry-picked” for specific building elements. For example, if you are adding a pergola or deck to an existing house in a bushfire area, and that house was unregulated (i.e. 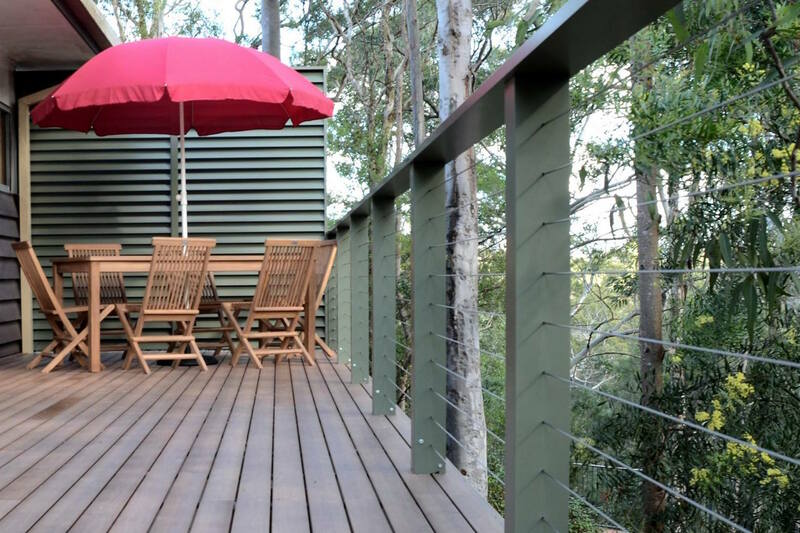 had no required bushfire measures) or constructed to AS 3959, the designer should use AS 3959 for the deck or pergola design. Spantec products, with few limitations, are equally suitable for inclusion in designs prepared using either AS 3959 or the NASH Bushfire Standard. The information below relates to Spantec products used in steel frame construction only as per the NASH Standard. Steel Carports, pergolas, verandahs and decks . 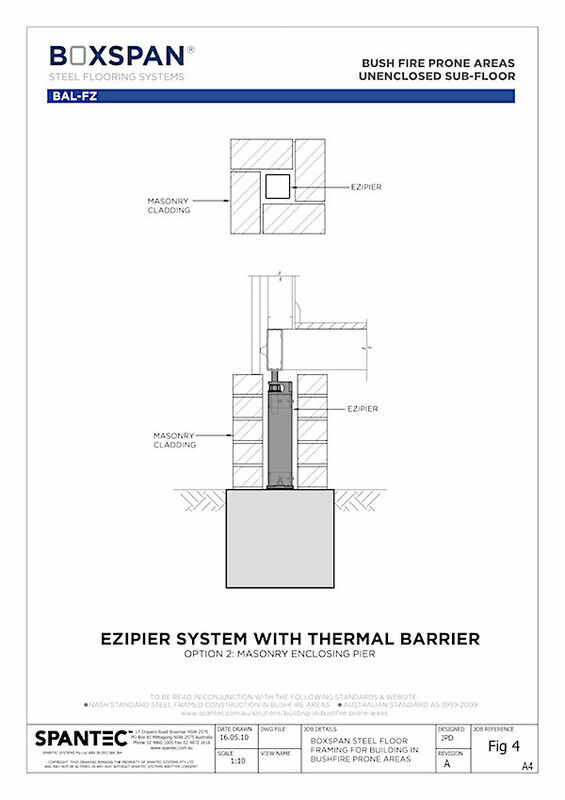 The construction requirements specified in this Standard are based on testing undertaken by the CSIRO and the application of fire engineering principles. The original test provided information relating to the performance of elements associated with a house constructed using non-combustible framing and materials when subjected to a simulated Flame Zone exposure. 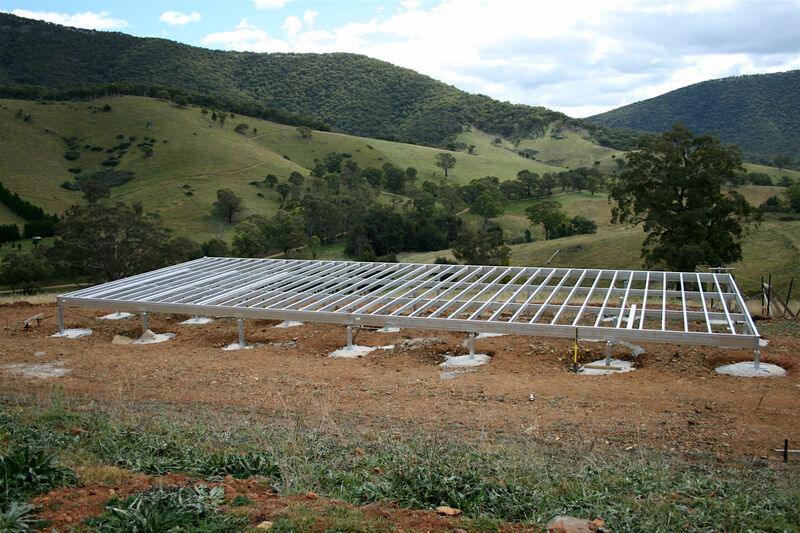 NASH – National Steel House Framing Association of Australia is the industry association representing manufacturers, suppliers and customers of light structural framing systems. All NASH standards for steel house framing are recognised and have been referenced in the National Construction Code (NCC) since 2006. The NCC performance requirements require residential buildings in a bushfire prone area to be protected from embers, radiant heat and flame contact; safeguard occupants from injury; assist fire fighting and occupant evacuation. 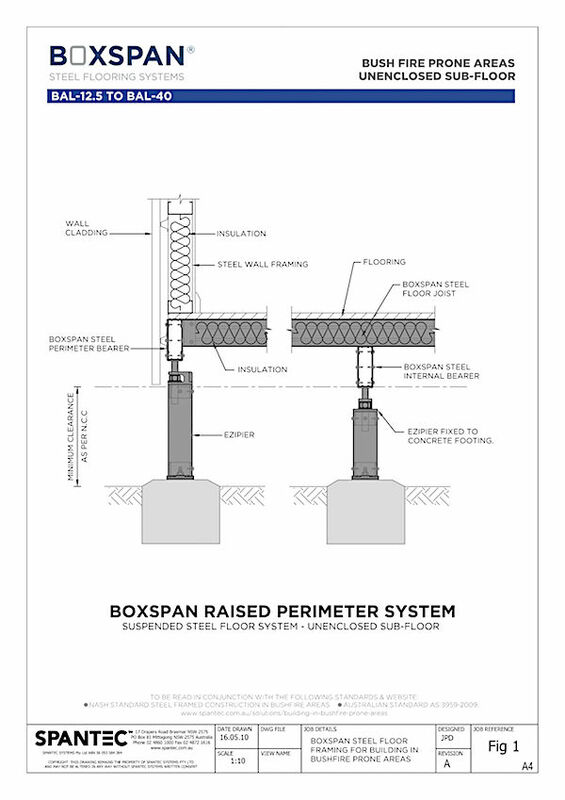 See how a steel framed house supported by a Boxspan floor system stood up to the test. The AS 3959 Construction of building in Bushfire prone areas standard has 6 levels of risk of bushfire attack, referred to as Bushfire Attack Levels (BAL). The BAL is a means of measuring the severity of a building’s potential exposure to ember attack, radiant heat and direct flame contact, using increments of radiant heat expressed in kilowatts per metre squared (kW/m2 ), and the basis for establishing the requirements for construction to improve protection of building elements from attack by bushfire. BAL–LOW Very Low There is insufficient risk to warrant any specific construction requirements but there is still some risk. BAL–19 Moderate There is a risk of ember attack and burning debris ignited by wind borne embers and a likelihood of exposure to radiant heat. The construction elements are expected to be exposed to a heat flux not greater than 19 kW/m2. BAL–29 High There is an increased risk of ember attack and burning debris ignited by windborne embers and a likelihood of exposure to an increased level of radiant heat. The construction elements are expected to be exposed to a heat flux not greater than 29 kW/m2. BAL–40 Very High There is a much increased risk of ember attack and burning debris ignited by windborne embers, a likelihood of exposure to a high level of radiant heat and some likelihood of direct exposure to flames from the fire front. The construction elements are expected to be exposed to a heat flux not greater than 40 kW/m2. 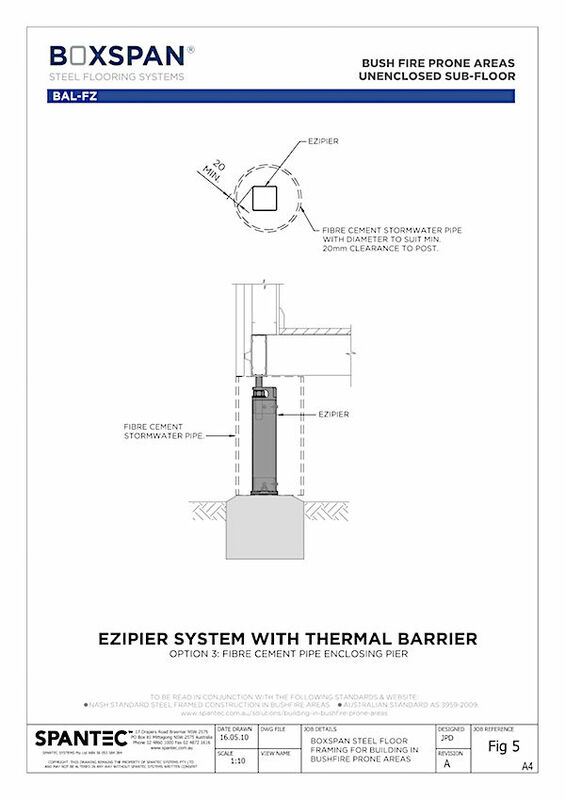 BAL–FZ Extreme There is an extremely high risk of ember attack and burning debris ignited by windborne embers, and a likelihood of exposure to an extreme level of radiant heat and direct exposure to flames from the fire front. 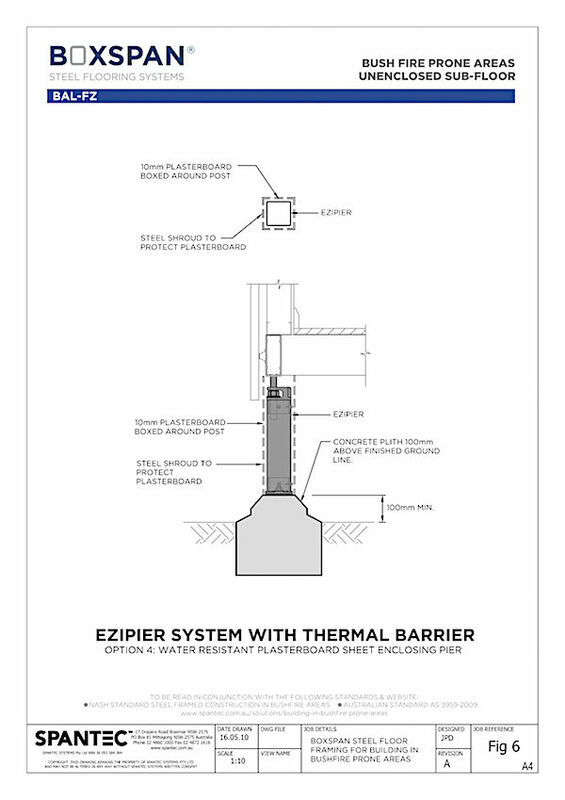 The construction elements are expected to be exposed to a heat flux greater than 40 kW/m2. 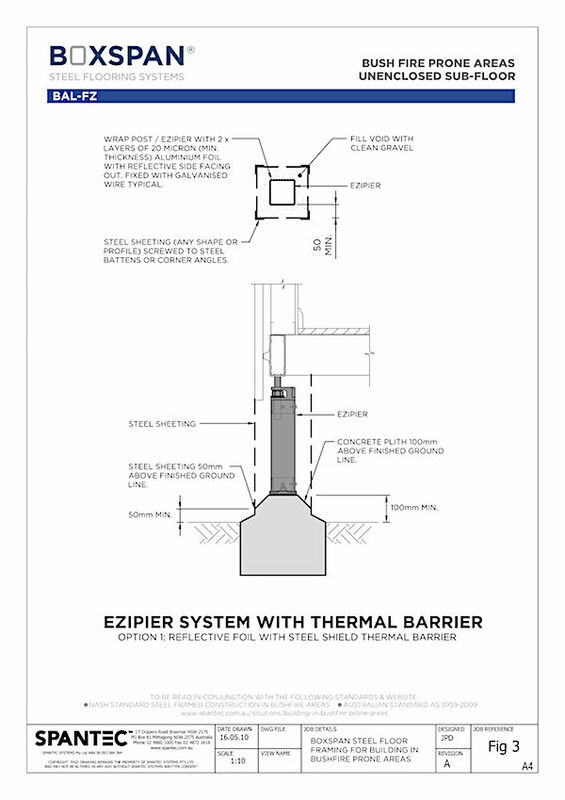 and columns Ezipier with adjustable or fixed pier heads Non-combustible. 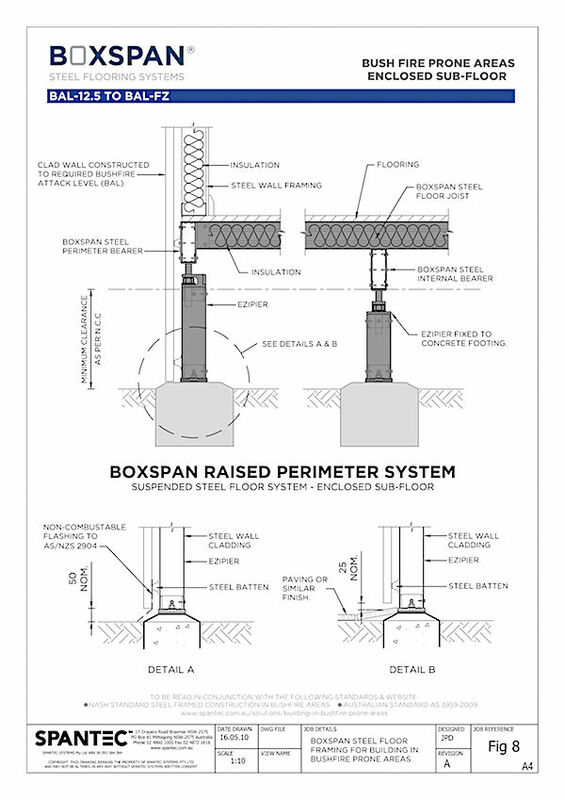 • In-plane joist and bearers with minimal clearance in accordance with NCC Non-combustible. Less than 300m (measured horizontally at the deck level) from glazing, that is less than 400mm (measured vertically from deck surface) must be non-combustible materials such as; fibre cement flooring, concrete topping slab (Liteslab®). Non-combustible such as; fibre cement flooring, concrete topping slab (Liteslab®). Non-combustible materials such as; fibre cement flooring, concrete topping slab (Liteslab®). roof beams Boxspan or Colorbeam roof beams Non-combustible. (N1-N3) and (N4 and greater) The suggested bracing solutions below should be raised with your engineer to design a solution that suits your specific house design and site conditions. • Protect some of the sub-floor bracing bays with non-combustible sheeting, with a minimum quantity to provide stability. 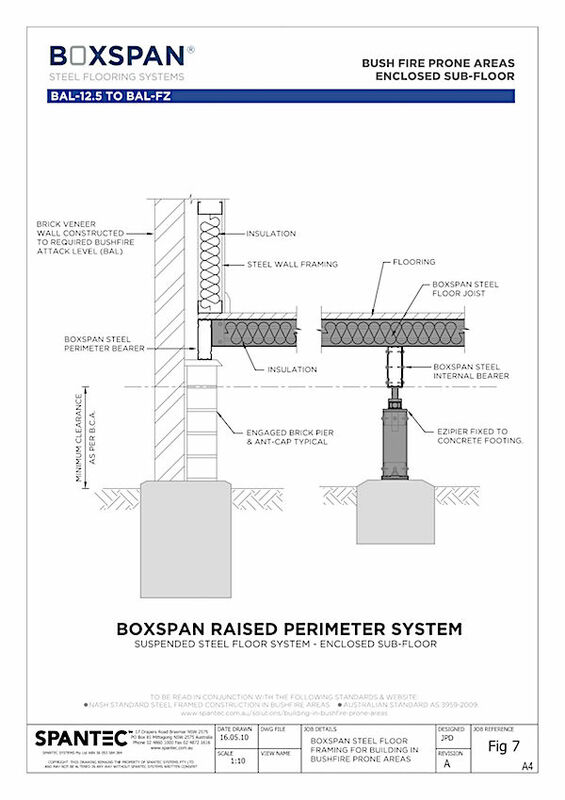 Bearers and joists Boxspan Raised Ring Beam system or Boxspan in-plane bearers and joists Boxspan in-plane bearers and joists to allow for lining under bearers and joists. Flooring Timber or non-combustible flooring. Flooring may be fixed under external wallframes, to the outer edge of frame and bearers. Timber flooring must be laid as a fitted floor with a 10mm gap from the inside face of the external wall frames. Non-combustible flooring may extend to the outer edge of the external wall frames. Insulation Non-combustible insulation, minimum R-Value 1.5. Held into place with non-combustible brackets/supports. Non-combustible insulation, minimum R-Value 1.5. Supported by under floor lining as noted below. 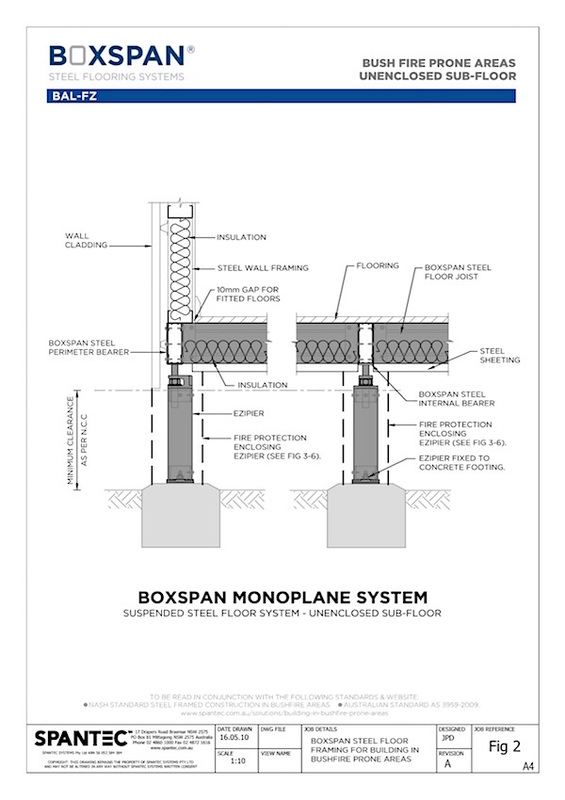 Under floor lining Not required Underside of bearers and joists lined with flat or profiled steel sheeting (minimum BMT 0.42mm) screw fixed to each joist and bearer with a maximum 600mm joist centres. Note: Underfloor lining is required in BAL-FZ to protect the flooring and frame from both radiation and flame contact. 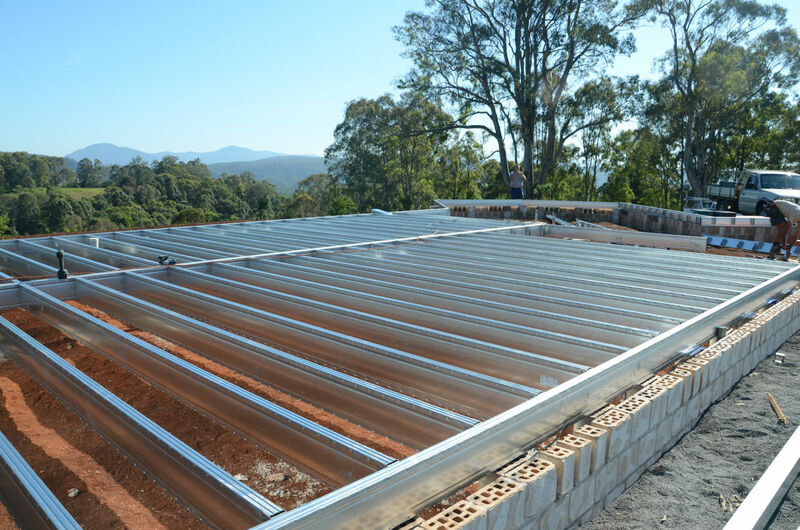 Where the sub-floor frame is enclosed by an external wall down to ground level, no additional requirements apply for the floor system as long as the construction of the wall system complies with AS 3959 for timber framing or Section 3 of NASH STANDARD Steel Framed Construction in Bushfire Areas – 2014 for steel framing . Ventilation must be provided in accordance with the NCC for your specific climate zone. If the allocated ventilation is more than 10 times the minimum required, the subfloor is considered to be unenclosed and should be designed as such. 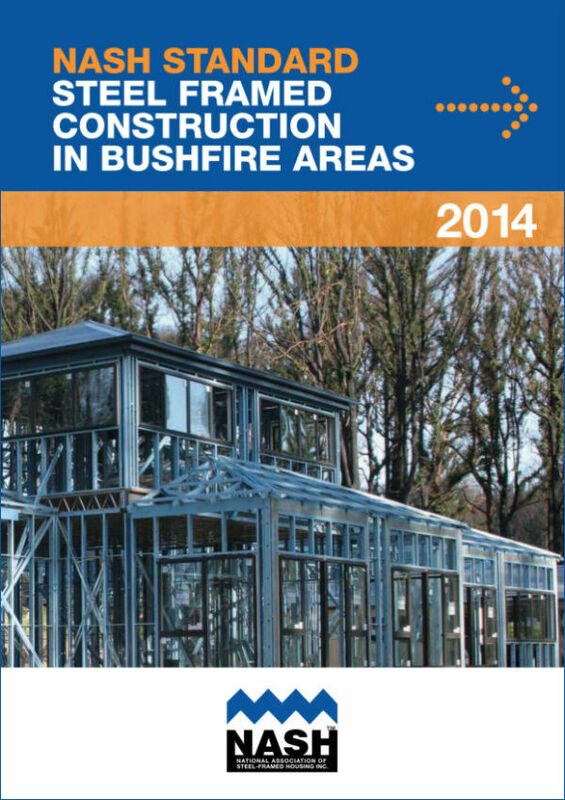 have no specific bushfire construction requirements.